Enid Dorothy Crystal Marx was born in London on 20th October 1902. She first went to school in Hampstead, then at the age of 12 she boarded at Roedean in West Sussex where she benefitted from an excellent art teacher. In 1921 she entered the Central School of Arts & Crafts to study drawing, pottery and printed textile design. After a year she went to the Royal College of Art (RCA), where she studied under Paul Nash, among others, with fellow students, and future RDIs, Edward Bawden and Barnett Freedman. The assessor failed her diploma piece as being too abstract but sixty years later the RCA appointed Marx an Honorary Fellow in 1982 and Senior Fellow in 1987. Gallimaufry, the College magazine, included Marx in its ‘Hall of Fame’ for 1925 because ‘among all the misses who flirt with Art, she alone woos it seriously’. Nash recognized her originality as a pattern maker and he encouraged her to become an early member of the Society of Wood Engravers and the Society of Artists. Marx spent a year in the studio of Phyllis Barron and Dorothy Larcher as their apprentice. She learned how to mix dyes and the craft of hand-block printing on textiles. In 1926 she set up her own studio printing her usually abstract and geometric designs on various materials. These soon became extremely fashionable and sought-after. A reviewer of the 1928 Arts & Crafts Exhibition Society’s exhibition, for the RSA Journal, said that ‘Enid Marx is an able designer; her printed linen…might be taken as a good example of a good collection’. Two years later a review of her first one-women show at the Little Gallery elicited an appreciation of her designs, ‘somehow she manages to combine forms that are essentially in the modern spirit with large harmonies that have the most agreeable traditional suavity’. Marx showed her work at many exhibitions including Zwemmer’s ‘Room and Book’ and ‘Artists of Today’ shows, as well as the 1935 Paris Expo. Christian Barman RDI of London Transport commissioned Marx to design seating fabrics for their trains and buses (1935). They formed a mutual admiration society, Barman praised her work and Marx wrote his obituary for Design magazine (1980). Other commissions included lining fabrics for luggage designed by John Waterer RDI. Curwen Press commissioned a number of her repeat patterns on paper to bind their publications. Book covers and wood engravings were commissioned by a number of publishers, including Chatto & Windus, Hogarth Press, Faber & Faber and Penguin, as well as being featured in various publications such as Artwork, The Studio and The Woodcut Annual. She also wrote and illustrated a number of children’s books and, with her lifelong companion, the historian Margaret Lambert, she published pioneering works on folk art – a subject close to her heart. English Popular and Traditional Art, published in 1946, was Marx believed ‘the first time there had been an overall survey, and the notion that there was indeed such a thing as English popular art’. Her bequest of the Marx-Lambert collection of 19th century ephemera, to join their holdings of British folk art has ensured that Compton Verney holds the largest collection of popular art in Britain. With Paul Nash and Eric Ravilious, Marx taught wood engraving at the Ruskin School, Oxford (1931-33) and she spent a term, as cover for an absent tutor, at Gravesend School of Art. She took her students, including the future RDI Sir Peter Blake, to see a considerable collection of ships’ figureheads. Blake hints that this might have been the start of his own enthusiasm for popular art. At the age of 63 Marx took up full-time teaching at Croydon College of Arts as Head of the Department of Dress, Textiles and Ceramics (1965-70). ‘I was rotten at admin…but the students were poppets’, she wrote. ‘I think they only wanted me for my RDI!’ She continued to help and advise students until she was well into her nineties. During the Second World War Marx was one of the artists invited by Sir Kenneth Clark to participate in his ‘Recording Britain’ scheme to record the country’s natural beauty and architectural heritage under threat from German bombing and other destructive forces. To her surprise her children’s book, Bulgy the Barrage Balloon, was an instant success. As well as writing and illustrating several more books Marx also produced little chapbooks, printed on offcuts to amuse the young during air raids. After the war Marx was invited to join one of the teams sent, by the British government, to Germany to report on how the Germans set about training designers. Margaret Lambert wrote up their findings in a report for the Board of Trade and its publication subsequently helped Robin Darwin form many of his ideas for reshaping the RCA when he became Principal. Marx went on a similar fact finding visit to the Scandinavian countries and reported that, in spite of the war, they had managed to achieve work of quality and innovation. Towards the end of the war Sir Gordon Russell RDI invited Marx to join the Design Panel of the Utility Committee. 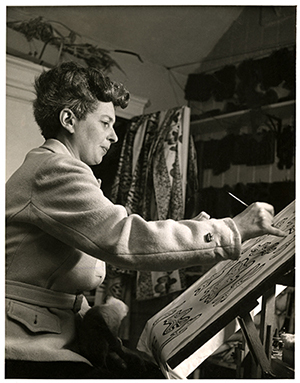 Her textile designs were produced by Alastair Morton RDI at Morton Sundour and exhibited at Britain Can Make It (1946). Morton and Marx shared a close and creative relationship for the rest of their lives. These utility fabrics also featured in the RSA’s Design at Work exhibition (1948) and she wrote the section on ‘Furnishing Fabrics’ in the accompanying booklet. For the Festival of Britain (1951) Marx helped RDIs Milner Gray, Reco Capey and Keith Murray select the furniture, furnishings and equipment for the Festival’s Royal Pavilion. Appointed a Royal Designer for Industry (RDI) in 1944 in recognition of her excellence as a ‘pattern maker’, the only member of the Faculty to be given this attribute, Marx felt that she was now accepted as a professional, ‘before I was like most women artists, just considered an amateur’. She regularly attended Faculty meetings and took an active role as a jury member for the RSA’s Industrial Design Bursaries competitions. Marx urged the RSA to be more proactive and influential in design education, she regularly encouraged them to extend their archives and raise their profile and she used the correspondence section of the RSA Journal to express her concerns about the British manufacturing industry, design and craftmanship. In her appreciation of the life of the Finnish textile designer Dora Jung HonRDI, for the RSA Journal in 1981, Marx wrote that Jung’s ‘weaving forms a beautifully illuminated page in the record of Finnish art and design’. A small, dark determined woman of considerable stamina Marx campaigned ceaselessly for the continuation of the direct, unaffected, but human design values that her generation had established before the war. Enid Marx died in London, at the age of 95, on 18th May 1998. To learn more about the work of Enid Marx, her relationships with other designers, and further resources, visit the Exploring British Design prototype web portal.